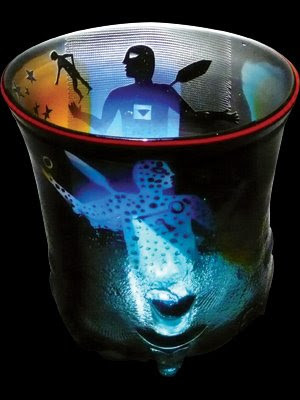 On April 23, 2009 Habatat Galleries in Michigan held "Masterworks: A Contemporary Glass Auction". Here is a list of the pieces sold that also have the selling price available online. Others may have sold, but the price is not posted online (instead of price there is written, "Call Habatat"). 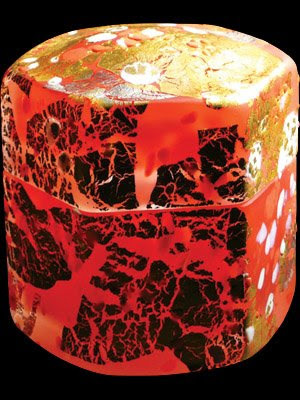 Shown above is Kyohei Fujita "Red Leaves" circa 1994 (mold blown glass box and cover with gold and platinum leafing) estimate $3,200-$3,600/sold for $3,450. The pieces that sold within the price range which Habatat estimated beforehand will appear in bold red, as Fujita's does above. On average, the successful pieces (with prices posted online) sold at 86% of their lowest estimate price. 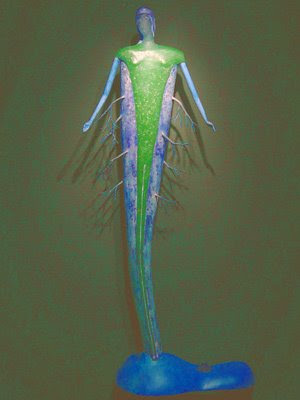 Dale Chihuly. 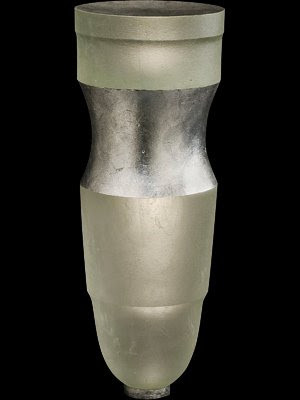 "Basket Cylinder Series" 1980 (blown glass vessel with shards) estimate $6,000-$8,000/sold for $4,312. 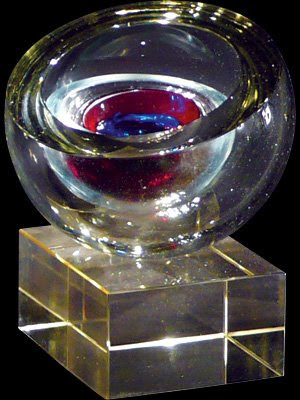 Harvey Littleton "Eye Form" (blown cut and polished glass sculpture) estimate $10,000-$12,000/sold for $12,075. John Littleton and Kate Vogel. 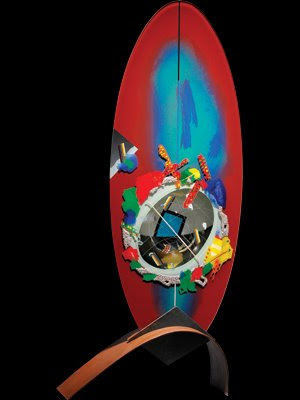 "Acro Bag" 1995 (blown and hot worked sculpture) estimate $2,800-$3,200/sold for $2,588. Mark Peiser. "Skyscape" 1991. 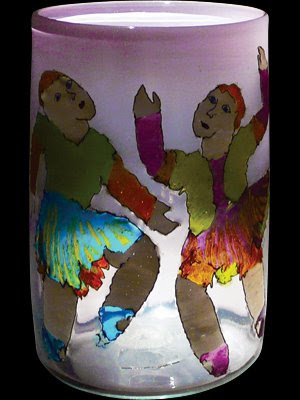 (cast glass sculpture) estimate $10,000-$12,000/sold for $12,075. 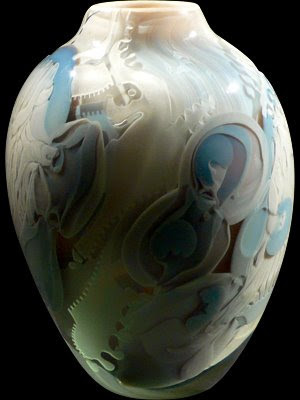 William Morris "Untitled #111" (blown glass vessel) estimate $9,000-$12,000/sold for $6,900. 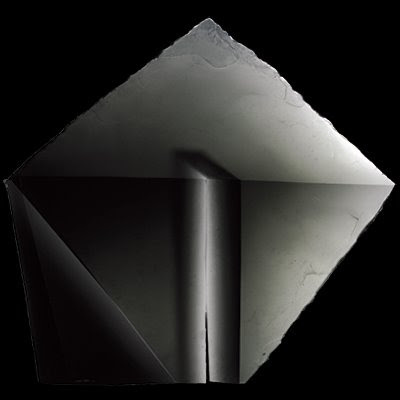 Bohumil Elias "Space" circa 1992 (blown and plate glass sculpture with mixed media and fired enamels) estimate $12,000-$15,000/ sold for $6,038. 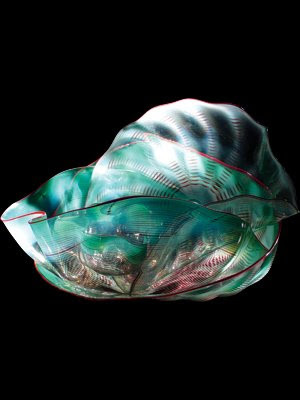 Dale Chihuly. "Seaform Group" 1990. 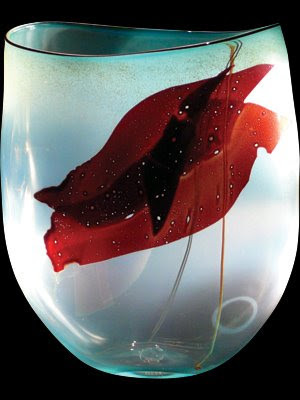 (blown glass sculpture) estimate $14,000-$20,000/sold for $12,075. Michael Pavlik "Dual Gate" 1985. 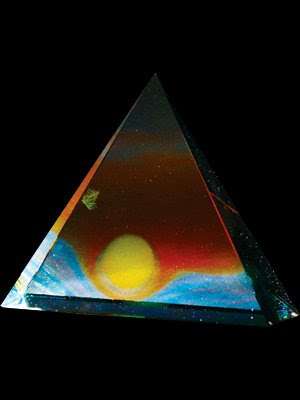 (cut polished and laminated glass sculpture) estimate $14,000-$20,000/sold for $11,788. Lino Tagliapeitra. From the "Batman Series" 1990. 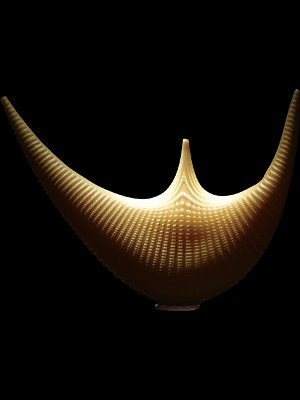 (blown and carved glass sculpture) estimate $24,000-$28,000/sold for $16,100. Bertil Vallien "Sand Blown Vessel" 1983 (mold blown and sand blasted vessel) estimate $6,000-$9,000/sold for$4,313. 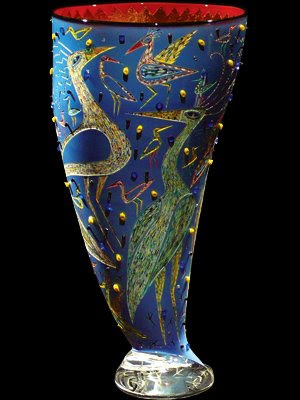 Keke Cribbs "Ibis Waltz" 1985 (blown, carved and painted glass vessel with beads) estimate $3,500-$5,000/sold for $4,025. Dan Dailey "Le Vin: Cristallerie Daum (The Wine)" 1993. 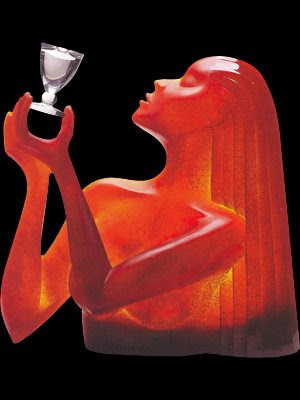 (cast glass sculpture-Edition of 125) estimate $25,000-$35,000/sold for $21,850. Robin Grebe "Untitled" circa 1995. (pate de verre and mixed media wall sculpture) estimate $7,000-$9,000/sold for $6,612. Howard Ben Tre "Wrapped Form #21" 2007. 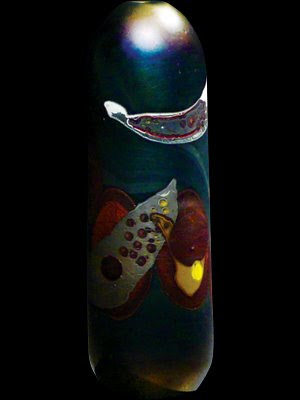 (cast glass sculpture with silver leafing) estimate $50,000-$64,000/sold for $34,500. John Kuhn "OST 199" 1999. 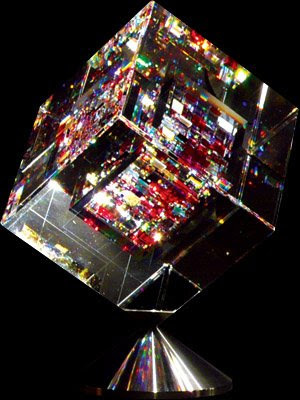 (cut, polished, and laminated crystal sculpture with stainless steel base) estimate $10,000-$12,000/sold for $11,500. 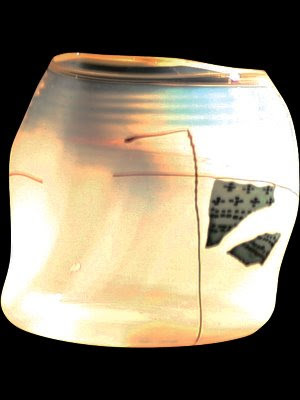 Joel Philip Myers "Contiguous Fragment Series" 1979 (hot worked glass vessel) estimate $8,000-$12,000/sold for $7,475. Martin Rosol "Duet XIV" 2002. 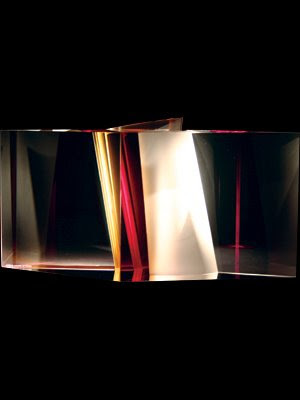 (cut polished and laminated glass sculpture) estimate $10,000-$12,000/sold for $6,000. Richard Ritter "Untitled" 1980. 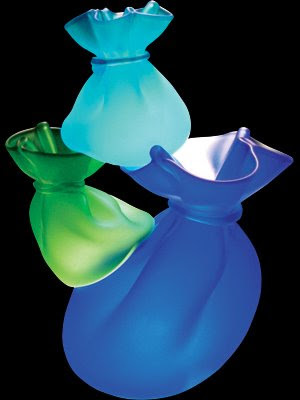 (blown glass vessel with murinni) estimate $7,000-$9,000/sold for $3,738. 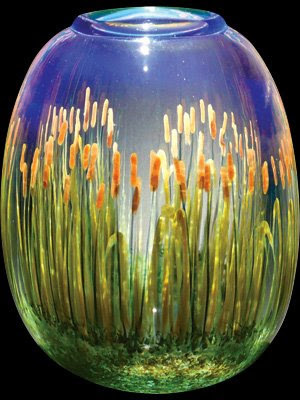 Mark Peiser "Summer Cattails" 1978 (hot worked glass vessel) estimate $14,000-$18,000/sold for $11,213. 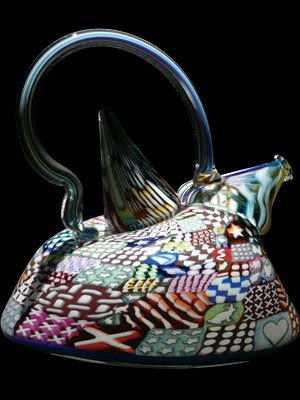 Richard Marquis "Murrini Teapot" 1985 (blown glass teapot with murrini) estimate $9,000-$11,000/sold for $10,350. 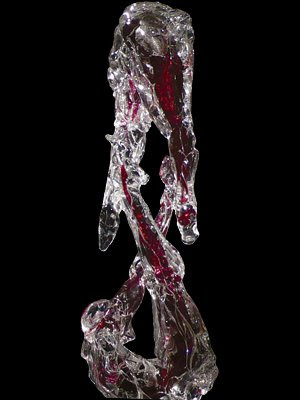 Martin Blank "Gold Ruby Duet" 2002 (hot sculpted glass sculpture) estimate $17,000 to $22,000/sold for $11,213. ABJ Online thanks you for joining us today!